Denny Hamlin brought home a solid top 5 finish. 4th to be exact, right behind his championship competitor Jimmy Johnson who finished 3rd. Denny once again proved that he would be a competitor for the Championship title. Denny commented before the is perfectly comfortable where he is. He said that in past chase races he gets to anxious and makes a mistake, and that he has learned from this. Denny also said, that he plans on making his moves that last 3 races of the chase. 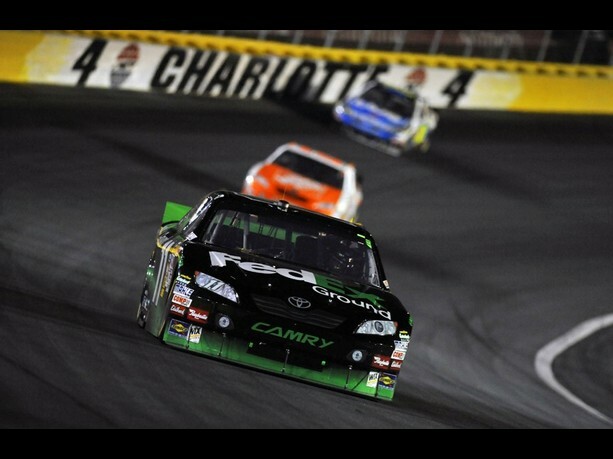 Denny paced himself through the Charlotte race for sure. Hamlin fought tight conditions coming off the turn all day but still quickly made it into the top 10. Track position was hurting Hamlin, but he still managed to make it up into the top 5 quickly. Denny led a lap during a round of green flag pit stops for the bonus points. At one time Denny was even ahead of Johnson, in the third position. The final restart is what killed both him and his teammate Kyle Busch. Kyle and Denny lined up behind eachother on the outside for the final restart. Kyle was first, and Denny was third. On the restart the outside line proved to be a mistake, for the first time that night, it wasn’t the dominate line on the restart. Denny lost a spot on the restart and Kyle lost lead for the night. Devastating for both of them, simply because Denny should have finished ahead of Johnson. Overall though, still a great points night for Denny. Denny has some dominate tracks ahead where he is better then Johnson. Next stop, Denny’s House; Martinsville.